The phone didn't ring on Friday night. "Hi, is that Rich? It's Charlotte from Perfect Urbex Match.com. I think we've got a perfect date for you." "You're joking?" I sat up in the chair. "No way..."
"She seems to meet all of the criteria you put on your profile. 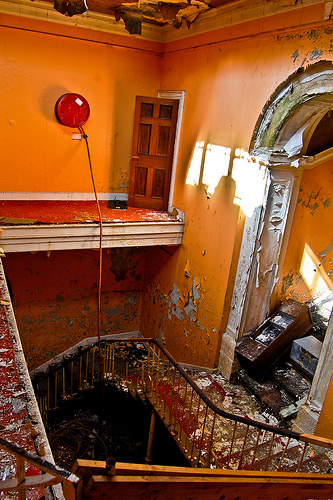 Interesting staircase, natural decay, urbex phone, wooden panelling, roof access, scary basement. You name it, she's got it." "Sounds good, in fact, very good." I replied. I paused, and tentatively, in a quiet voice asked the next question. There was a delay, and then voice on the phone replied. "Yes of course Sir, I believe she is a virgin." 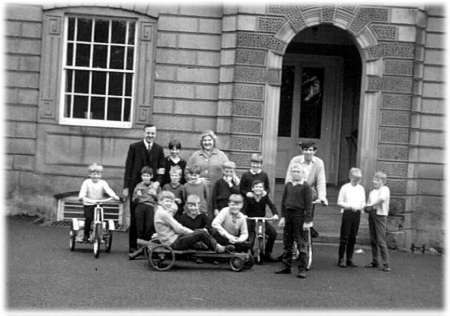 We were off, to Bramham House, outside Leeds. It had been the very first place I had been to eight months ago. Then it was shuttered and sealed. Today, we struck gold. This beauty had been built in 1806. By the mid nineteen sixties 5 residential house parents lived there, 3 non residential house parents, a daily domestic staff consisting of cook, seamstress, gardener and 4 cleaning ladies, together with a lady to iron. 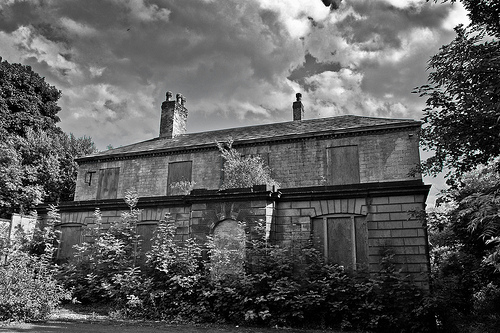 Many of the domestic staff were from the small, picturesque village of Bramham. Here they all are, outside the now overgrown front door. Inside the front door, half a telephone sits on a beautiful radiator. There was no dial tone. 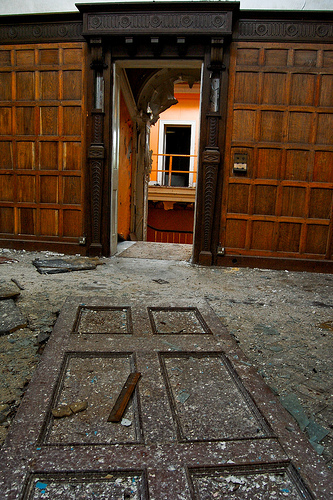 The door to the left leads to the old ballroom. 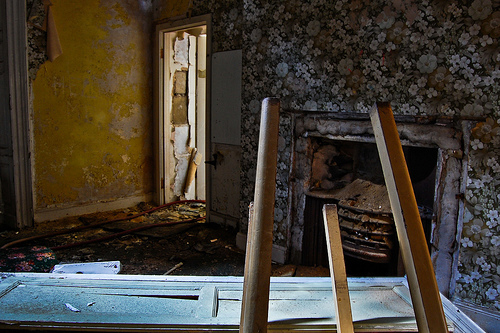 It was later used for the dining room. The food was eaten in silence, and delivered from the kitchen using the dumb waiter. We decided to go upstairs first. 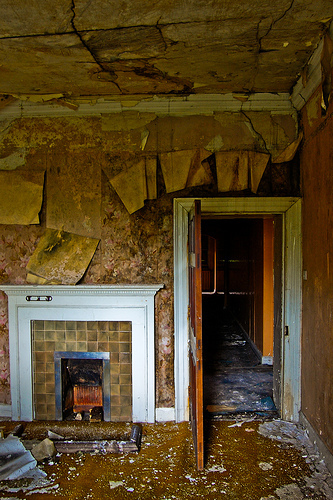 The house was wet, and the carpets waterlogged. The parquet floors, once polished and shiny were water damaged and lifting. Underneath the peeling plaster archway, a small flight of steps led up to the oak pannelled Rose room, later a five bed dormitory. 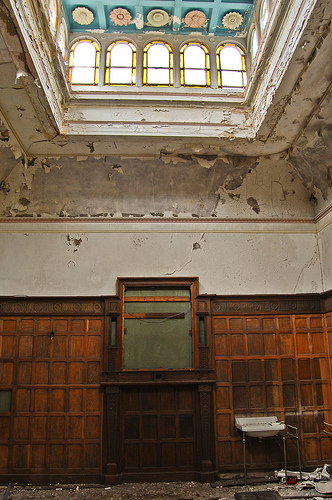 The room was damp, the windows on beautiful glass dome above broken. We took some pictures and moved on. 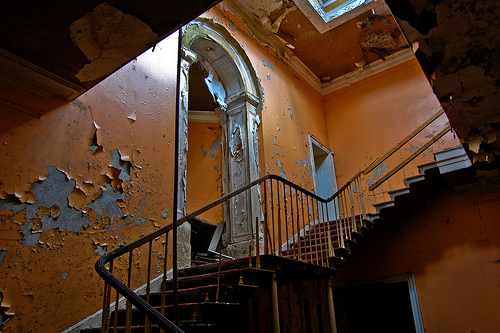 Heading upstairs, I hoped the landings were fairly secure. 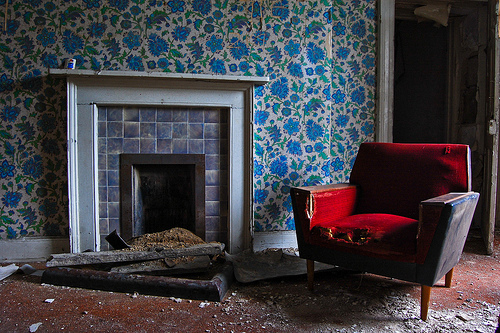 The carpet oozed rainwater and the smell of decay pervaded the house. 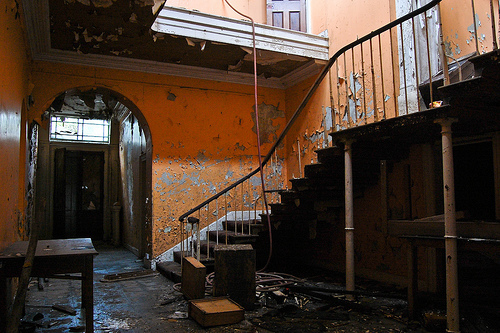 Below, the staircase snaked down to the hallway. 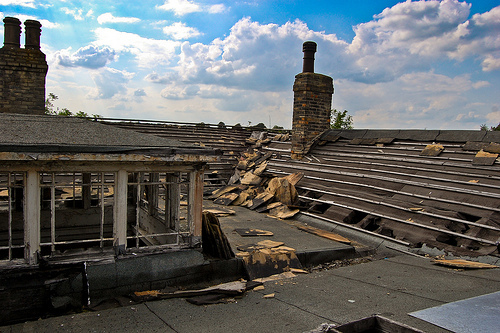 Upstairs were more dormitories. Wall paper from the late 1970's and 1980's peeled and hung from the damp walls. The home closed in 1984. Some of the dormitories had some furniture inside. 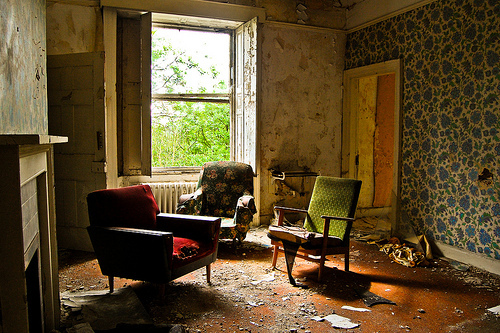 Warderobes, chairs and a settee remained. It was nice to see urbex cliches at every turn. Another dormitory. The warderobe had fallen over. More lovely wallpaper. 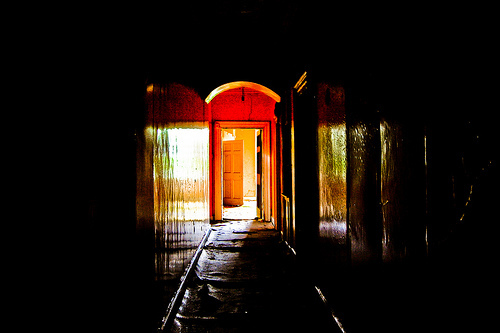 Some of the corridors were dark. 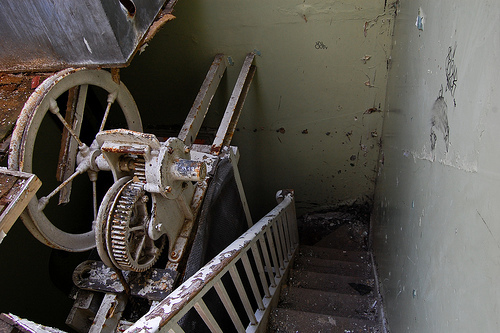 A tiny staircase led upwards, past the lift machinery. Wonderful yellow sandstone tiles. Stolen by nasty people. Because of them, the house has probably had it. 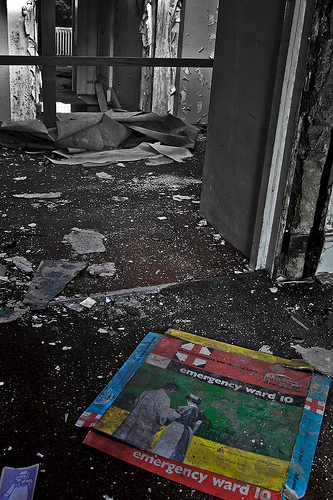 Time was ticking on, and we headed back down inside the children's home. I was disappointed to have missed a tiny room under the stairs with a large trapdoor in the middle. Apparently it leads to a deep well below the house. That's another great photograph I haven't taken. 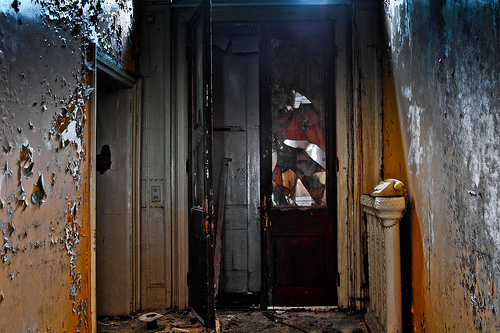 In the dark, the torches picked up a flight of steps leading in to the basement. Down here was much cooler. The rooms were very dark. 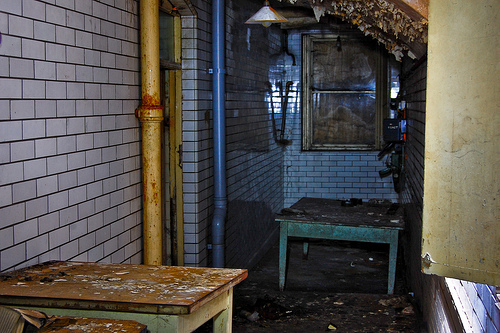 Storerooms, a large kitchen and a scullery led off the corridor. Old tables were in the corridor. 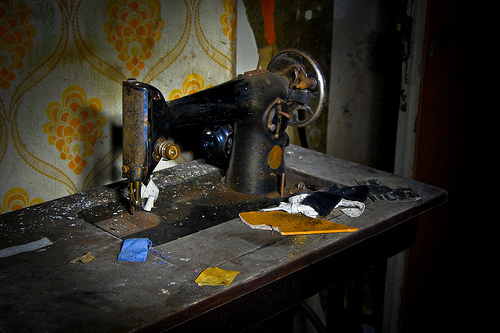 Back up and an old sewing machine in the Superintendant's lounge. Leaving, I took a last picture, headed out through the empty playroom, once the old library, and disappeared.